Process and inspiration, thoughts & musings. 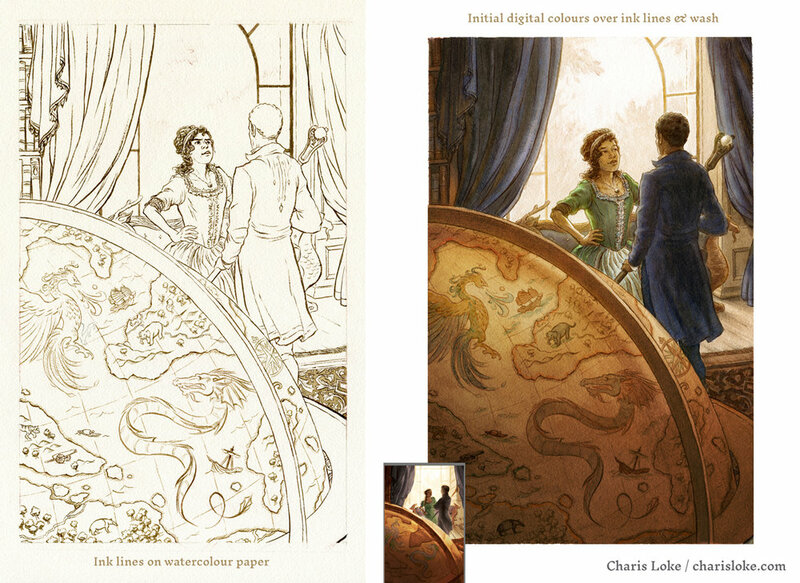 In this post: a walkthrough of the completed 'Sorcerer to the Crown' cover illustration, from inks to digital colours. It's been a while since I last wrote about this project, but here is an update! 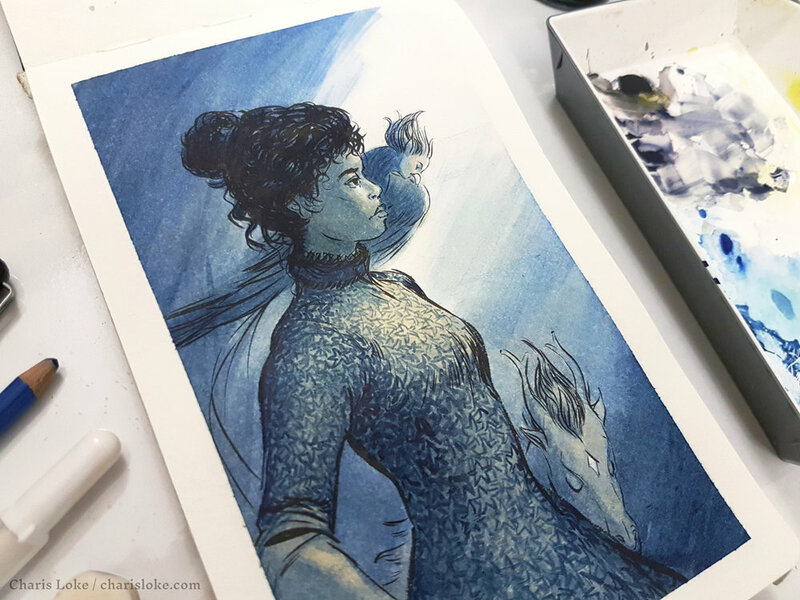 Previously I'd described the process up to the value sketch (read about it here); this post will take you through the colour studies, line drawing, ink and painting, and final digital adjustments. COLOUR STUDIES: Exploring different options. I was a fan of the more graphic, limited colours I accidentally generated when working on the colour studies, and #3 and #4 could also be interesting directions to pursue, but I decided to go with a cross between #6 and #8. DIGITAL LINE DRAWING: Fleshing out elements, figuring out the face. Next up was to make a more detailed line drawing, where I worked out how different elements looked like in the image. I went through different iterations of the face as well; I tend to not draw particularly expressive faces, so I tried to push here to get an appropriately irreverent expression for Prunella. This won't be the end of the faces. I printed out the digital lines, and transferred them to Arches watercolour paper using pastel pencil on the reverse of the printer paper - I scribbled out a layer of pastel, then turned it over and, using a pen to press down on it, traced out the lines. Much careful inking then followed; I'm using Daler Rowney FW Acrylic Ink here - a mix of sepia and black, diluted accordingly. Inking is therapeutic. There are few things more soothing than the sound of a brush going over paper, and the physical motions of making careful strokes. I loved drawing the map. But I managed to ink the face wrongly! I then laid down more ink washes to establish values on the piece, as much as it pains me to paint over those map lines. Next, I scanned the piece in portions, then stitched it using Photoshop's File > Automate > Photomerge command. The next big part to tackle was adding colours, layer after layer, making use mostly of Multiply, Overlay, and Screen modes. Justin Gerard's post on Muddy Colors here goes over the basics and I highly recommend reading it. And Prunella's face gets redrawn! I sample some of the paper texture from the background to ensure that the new layers of (digital) ink and colour blend into the image. Taking a step back and leaving it for a few days helps; when I return, I get to tackling the lighting. The whites of her skirt have been toned down, thanks to feedback in class from Marc, and the focus is on Prunella's face now. A few more touches of detail - the embroidery on Zacharias' coat, swirling vines on the green fabric of Prunella's dress, some rays of light and texture on the map - and our Sorcerers Royal are complete. In this post: character studies and sketches for a personal project, illustrating 'Sorcerer to the Crown'. FW Acrylic inks on paper, digitally painted over. And Prunella Gentleman, normally possessed of much more vigor and sass, in a somber state at the Royal Society of Unnatural Philosophers. Pentel Pocket Brush Pen, FW Acrylic ink, on a Moleskine watercolour notebook. Digital painting over the scanned image. Each sorcerer is accompanied by a familiar, a magical being. 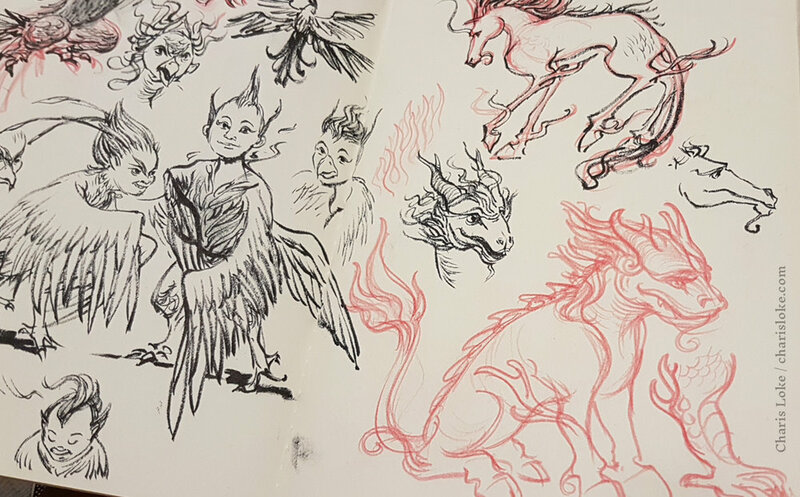 Prunella comes into possession of three: a garuda, a qilin, and an elflet. 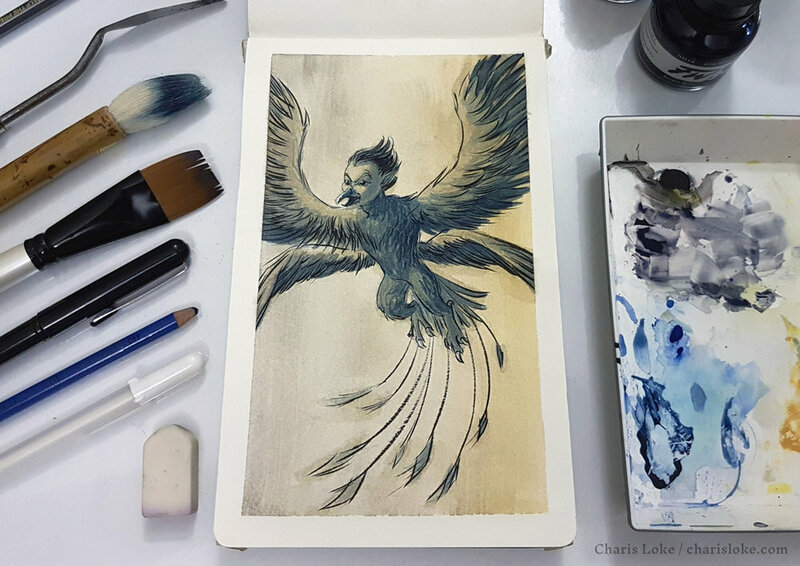 There are a myriad of ways to depict these three - the garuda is a holy bird found in both Hindu and Buddhist mythology, as well as in the legends of Southeast Asia. Indonesia's take on the garuda is less anthropomorphic, and based on the Javanese hawk eagle. Since Tjandra is specifically described as posessing the face of a child with a golden beak where its nose and mouth should be, I've gone with that, while keeping to more bird-like features elsewhere. Pilot Brushpen on a recycled paper notebook. More flames and feathers to come! 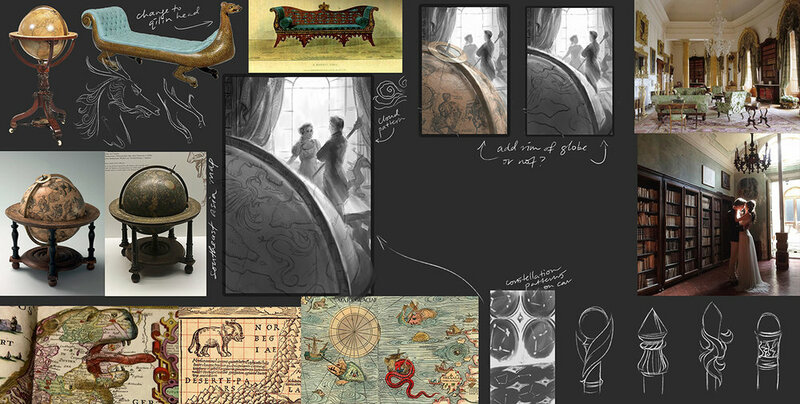 In this post: sketches and inspiration boards for a personal project, illustrating 'Sorcerer to the Crown'. Ever since hearing about Smarter Art School years ago, I've wanted to take part in one of the mentorships. This fall, I'm fortunate to be in Marc Scheff's Illustration 102 group alongside classmates who've been posting very inspiring work so far (and we're only 3 weeks in!). I'll be keeping notes on my progress through the class, as well as posting the development process of the pieces I hope to complete by January. The text I'm working off is 'Sorcerer to the Crown' by Zen Cho, a Regency-era novel about magic and empire (read it if you havent!). There are many reasons I love it, among which are the fact that it features characters from the Malay archipelago, smashes genre tropes, and made me laugh out loud when I read "Mana pintu ni?" in the text because I knew what it meant. How many times do you see a language you know in a work of fantasy fiction? To begin, I put together a page of information about the book for the benefit of those who may not have heard of it. Using a technique from Sterling Hundley's Ideation class, I also listed opposing pairs of ideas from the book. Being able to depict these more abstract ideas on the cover would enable it to communicate about the book's themes without being solely a literal representation of characters or items from the story. Initial planning for the cover and interior illustrations: identifying key themes and characters. After that, I sat down with a pencil and scribbled out ideas for the cover as well as an interior illustration. These were done on recycled printer paper and a toned sketchbook, then photographed with a phone camera and quickly edited in Photoshop - I was travelling at the time, without access to a scanner. 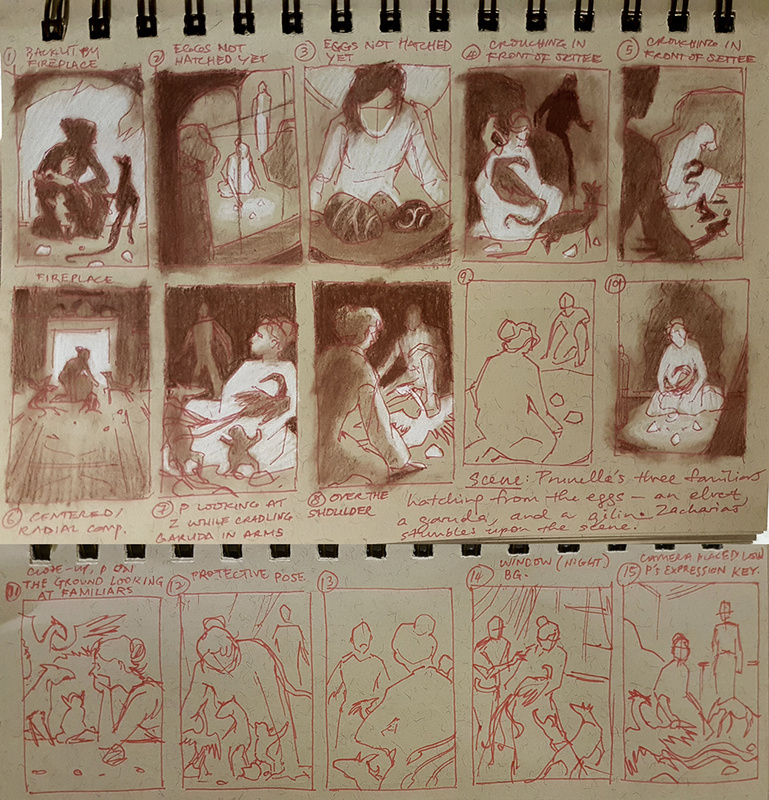 Thumbnails for an interior illustration showing the hatching of Prunella's three familiars. I brought both these sets of thumbnails to the second class, where we spent more time talking about the cover. To my surprise, #4, which I'd initially written off as not being very 'cover'-like, caught people's attention. Marc began to paint over it, rearranging certain elements; I realised that the globe could do more than simply depict a map of the Southeast Asian region. 'HC SVNT DRACONES', read old maps that show uncharted territories, furnishing illustrations of mythical sea monsters and beasts. Sorcerer has plenty of fantastic beasts; why not put them on the map as a subtle nod to the story? Suddenly, thumbnail #4 was a lot more exciting. Next up was looking for more specific visual inspiration for the characters. When searching, I look for poses or expressions on faces which I think convey their personalities well. This was also time to get lost down the rabbit hole of period-specific costumes and accessories. Inspiration board for Zacharias Wythe. Inspiration board for Prunella Gentleman (you can't beat this name). Side note: I also read up about Maharani Jind Kaur, former regent of the Sikh Empire and feared by the British, after finding a portrait of her in a Guardian article. Without giving too much away, let's just note that she would be an excellent reference for one of the characters revealed towards the end of the book. The scene in the thumbnail cover isn't specifically from any page in the book, but I knew that it made sense to be set in Zacharias' study. I also looked up ideas for the architecture and interior design of the room, which had to look like something befitting a high-ranking practitioner of magic in London. While looking for furniture ideas, I stumbled upon an intriguing dragon settee which I knew I would want to repurpose and add to the background. This and other pictures got pulled into the canvas in Photoshop, where I began to refine the thumbnail by drawing details on it. Refined thumbnail with explorations of patterns for fabric and possible staff designs. We then talked about this in the third class. I had concerns about whether the globe looked right, especially when put so close to the camera/viewer, and noticed the staff and settee forming tangents with the curtain and edge of the picture respectively. Marc suggesting pushing the settee further back so that it drew less attention to itself, giving Prunella a bit more expression, and also tilting the globe to get rid of the awkward cramp in the bottom right corner. A fellow classmate, Dan, sent a photo of an absolutely stunning wooden globe, half of which depicted the moon, the other half of which was outfitted with lots of measuring elements. I don't know if I would add a ton of globes to the room, but having more 'magical' items in the background would serve to enhance the sense of place. Refined thumbnail with paintover additions from Marc. The next step will be doing colour studies to figure out how this looks in colour. I'm a little intimidated by this, as I've always preferred working in ink and drawing images primarily with monotone lines. But it'll be a good learning experience! This is where you'll find me writing about ongoing projects, works-in-progress, and subjects I hold dear. Geeky Baju featured in an upcoming exhibition of Malaysian artists!